CareConnect is selecting the patient education and discharge instructions to be used by the electronic health record system, with a couple of vendors expected to demo their materials by the end of the month. These materials are used as handouts for patients after emergency department and inpatient discharges, ambulatory visits, and point-of-care teaching in all care environments. Patient discharge instructions might detail what a congestive heart failure patient needs to know immediately after leaving the hospital. Patient education materials could provide information a patient needs to care for their child’s asthma following an ambulatory visit. 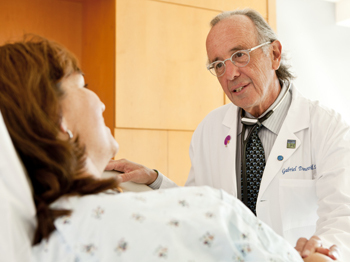 Patient education and discharge instructions can be individualized to fit patients’ needs. Faculty and staff members from inpatient and ambulatory nursing, emergency department, therapies, and surgery have come together to help select a vendor for these materials for use in CareConnect.